Investors in early stage ventures need to focus on strategic exits if they are to achieve a high return on their investments. This book explains the characteristics of strategic value, how the investor should negotiate the investment and how they should manage the process to a strategic trade sale. The book includes a very detailed discussion on the problems of high growth ventures, the unrealistic expectations associated with IPOs and the advantages of investing in strategic value ventures. This book provides a detailed examination of the investment and exit opportunities in financial and strategic ventures. Underpinning the creation of value in both of these ventures are the drivers of high growth potential. In the case of a financial venture, the business itself must create the business model to exploit the growth opportunity. A financial business must build an organization which is capable of creating, delivering and supporting products and/or services in very high volumes. The probability of creating a successful high growth venture is very low due to the complexity of building out such a business model. Only the most successful will be able to drive the revenue and profit needed for an Initial Public offering (IPO). Those which are not able to achieve an IPO need to structure themselves for a financial trade sale. 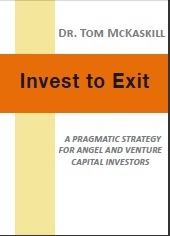 The major recommendation in the book is that Angels and VC investors should focus on strategic value investments. These investments have very focused exit strategies which generally have lower execution risks, shorter timescales and higher returns than financial trade sale exits or IPO exits. The book provides a detailed analysis of the product or service characteristics which create strategic value, a set of guidelines for identifying strategic buyers and processes for setting up the investment deal and the strategic sale. Included in the book is a detailed explanation for preparing a business for a strategic exit.